I'm always looking for ways to organize my home, and if I can do it for cheap and make it unique - even better!! I found this frame for $3 on clearance. The design is certainly unique, but not really the color scheme or patterns that I use in my home. It has honestly been sitting my craft stash for a while now, just waiting for the perfect craft opportunity. 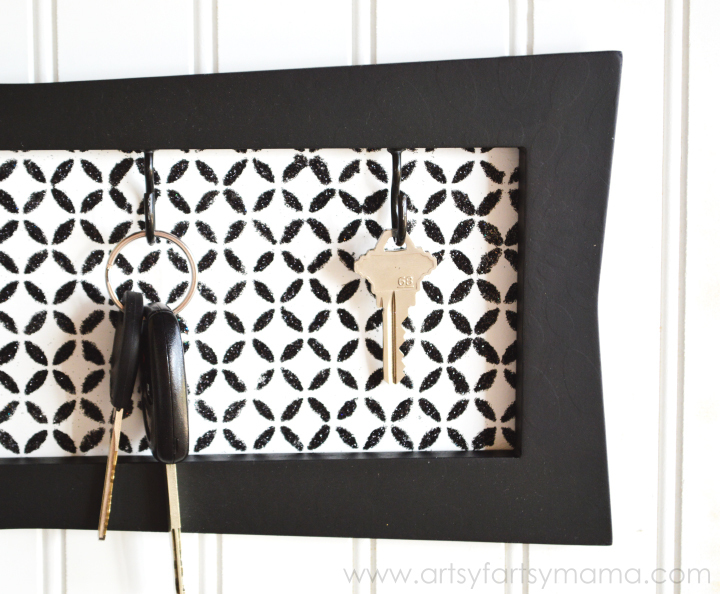 Add in a few screw hooks, some paint, and glitter (of course), and you're on your way to easily making a DIY key hanger!! First, I lightly sanded the frame and backing piece and sprayed them with a couple coats of spray paint. Black for the frame, and white for the backing piece. Let dry completely. For the stenciling, I used one of the new Mod Podge Rocks Peel & Stick Stencils in the tangier pattern, black glitter, a spouncer, and Mod Podge. Since I was going to be using glitter on the stencil pattern, I went with glitter Mod Podge instead of regular to add a little extra sparkle. Using the stencil is simple. The back of the stencil is adhesive, so it will lightly stick to your project to help prevent it from sliding around and from paint or Mod Podge seeping underneath. The main advice I have to give is to work quickly because Mod Podge can dry fast. Do the stenciling during a time you will be interrupted the least (if possible). Also work over a scrap piece of paper to easily pour the glitter back into the container. 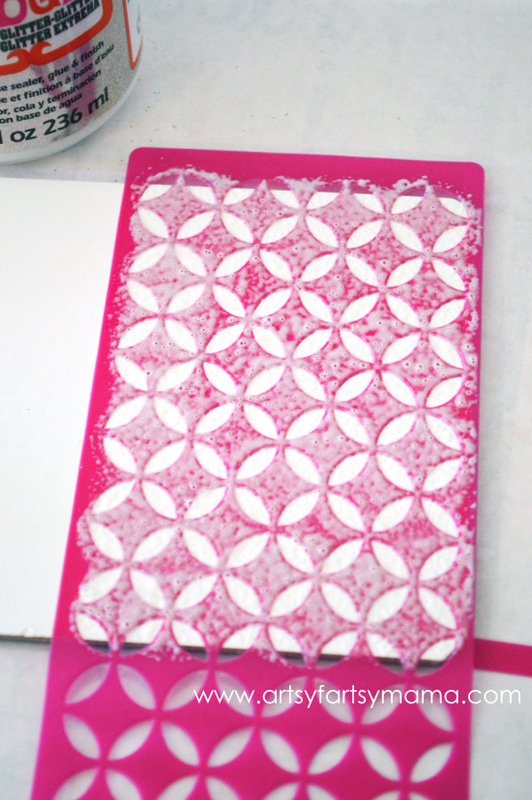 Place your stencil on the backing and add a light coat of Mod Podge over top with the spouncer. Use the Mod Podge as-is - do NOT dilute it! 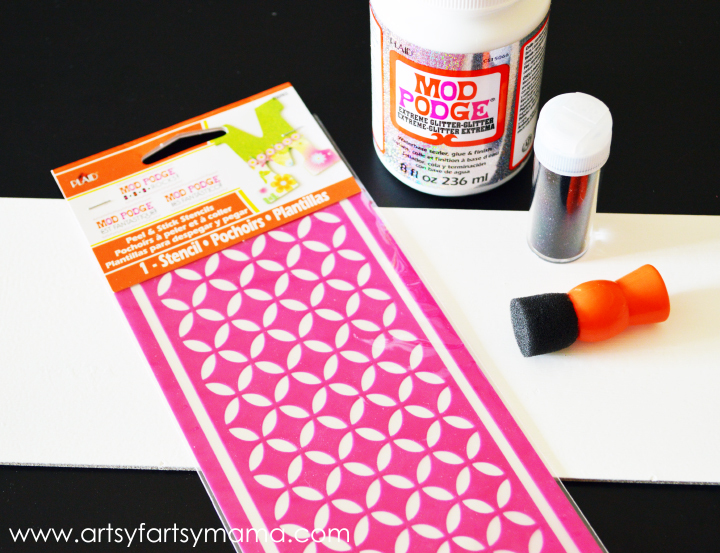 Carefully pull up the stencil and you will see the stenciled pattern in Mod Podge. 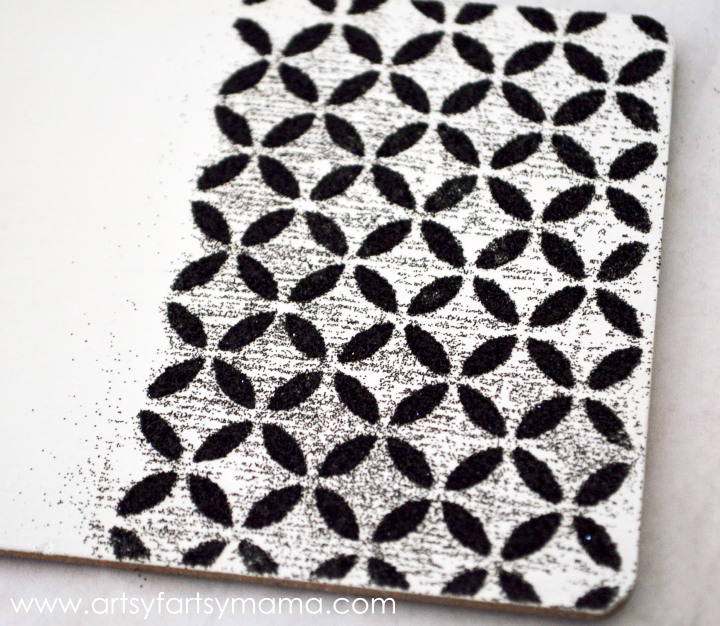 Pour the black glitter all over the stenciled area. Let sit for a minute or two, then carefully stand the backing up and tap off the excess glitter. Lightly brush over the area with a paintbrush to remove the glitter that is lingering around. Rinse off the stencil after each application. The Mod Podge is water-based, so it should come right off. Pat dry with a paper towel, and let dry. The stencil backing stays pretty sticky for up to 20 uses after cleaning, so it's pretty convenient to use over and over again! 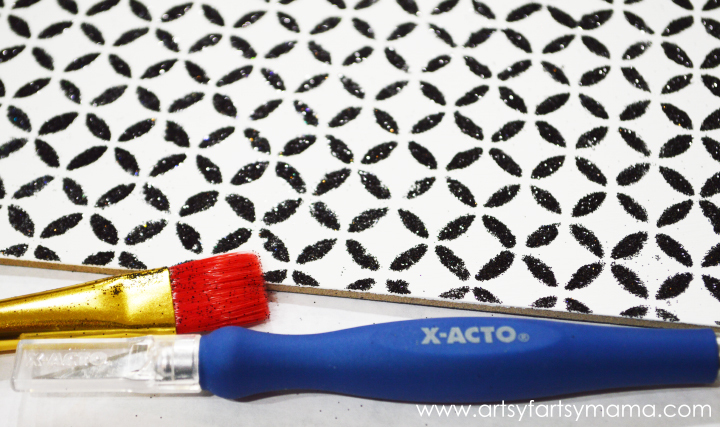 Once you're done stenciling, let the backing dry completely for at least a few hours. Once dry, you can brush it a little more to get extra glitter off. I also had a couple of spots bleed, so I just used my handy X-Acto knife to scratch off the messed up spots. If you have the opposite problem and have some spots that didn't get covered as much, just use a small paint brush with Mod Podge and re-glitter (like you would do touching up a regular stenciled project). 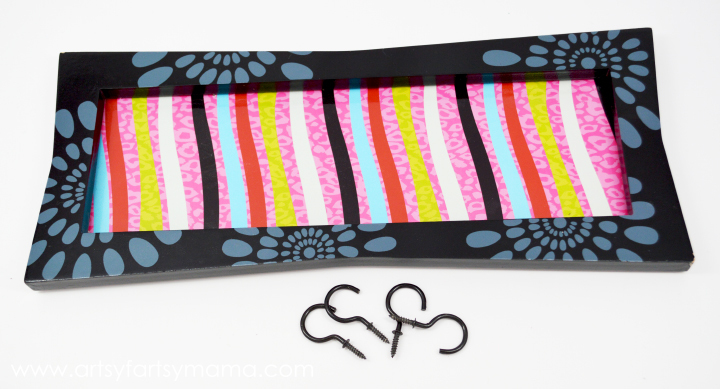 Add the screw hooks into the top inside part of the frame, and place the backing back in. 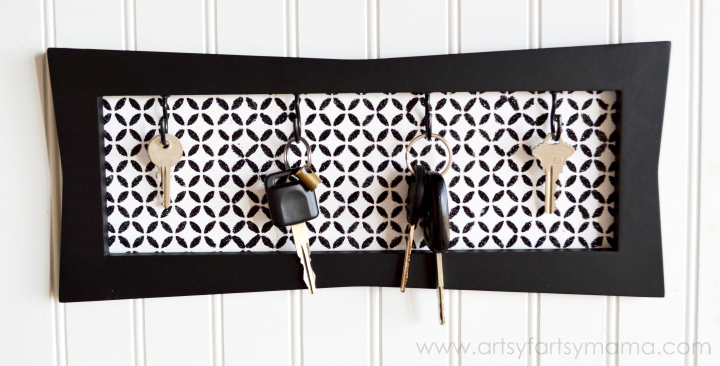 Now you have a fancy DIY key hanger that will make your home even more YOU!! Because I love sharing awesome products with you, I wanted to do a giveaway for one of YOU to win one stencil from the Mod Podge Rocks Peel & Stick Stencil collection! The giveaway will end on Wednesday, March 12th. Winner must be a US resident. Awesome! I love that the back is sticky! My stencils always slip! I am loving the Tangier stencil! They are all very cute! Hey there. I like the key stencil. My daughter would get a kick out of that too. I love the wood grain stencil! That turned out so cute, it was kinda scary before. Looks great. You are so creative...love it! Key Stencil is my favorite! And all the others too! I love that tangier stencil! Great idea for a key hanger. Turned out so cute! I like the skeleton key stencils!